I have no idea who these guys are. But they were willing to pose for a photo after I stopped to chat with them. I wanted to express my appreciation for doing their bit among the many thousands of emergency services, military, and security contractors who made today’s Jerusalem Marathon possible. Ordinarily, I feel gratitude in my heart, though I tend to hold it inward. I’ll usually try to remember to say thank-you to an individual or small group if I feel a sense of appreciation, or if it’s just the courteous thing to do. But today was a little different. WARNING: if you get easily ticked off and flared up reading religio-political commentary, especially where frictions in Israel society are exposed, in all their ugly hostility, please stop reading now. I don’t want to get folks’ anger buttons pressed, and expose their resentments. That’s not my aim, not my purpose, and it’s not what I’m myself feeling right now. My aim is … appreciation. There were demonstrators at the marathon this year. Maybe they were out there in past years, but if they were, I hadn’t noticed. This year, around kilometer 3, on King George St., I nearly tripped over one. Had that happened, I’d almost surely have gone flying. On the infrequent occasions that I fall when running, I tend to recover my balance or at least manage to go into a roll, and thus prevent serious injury. But who knows. The field was so crowded this time, and I was frankly clueless that the person blocking me was actually _trying_ to cause disruption and damage. Honestly, my mind didn’t acknowledge that there could possibly be demonstrators intentionally blocking the path of the runners. My “תן כתף זכות” (“give the benefit of the doubt”) mechanism kicked in and registered him as a photographer, because there are actually photographers who sit, unobtrusively, along the route, snapping pictures. So what was I to think when suddenly, I saw a police officer literally drag the demonstrator out of my path, just in the nick of time as I was about to plow into him full throttle. And a few additional cops were guarding some of this demonstrator’s buddies, whom they’d apparently managed to apprehend and pull off to the roadside, moments earlier. The demonstrators were chanting slogans, though it was hard to make out what they were shouting, as I was plugged into my running music. Further down-route, there was another demonstrator carrying a sign. Something about the marathon being terrible for the Jews, and government policies that harm yeshiva boys. Though to be honest, I don’t know if the latter guy was connected with the first group. To my pleasant surprise, I didn’t for a micro-second feel any sense of anger. From the get-go, my predominant emotion–really the only thing I felt about the incident–was gratitude and appreciation toward the police officer who exerted himself dragging away the demonstrator prior to my having a collision, and his colleagues who were involved in managing the situation. And also toward the other runners, who stayed focused on the race, and kept their collective cool. That we’re living in such “interesting” times, and somehow manage to pull off a full-blown city-wide athletic event, in Jerusalem of all places, is to me nothing short of miraculous. Thank you, God, for again bringing us to this season. May we merit the ability, the willingness, and the heart-felt desire to practice really listening to one another, acknowledging in thought, word, and deed the Essential Humanity that unites us as a Species. When I compare how little enthusiasm I had during the weeks leading up to this year’s race, with the pure, unmitigated, and open-hearted joy I experienced during the actual run, I’m only reminded of how important it is to consciously and actively work to perform the heavy lifting needed to move beyond energy draining karmas (read: ambivalent moods) and, as the famous athletic shoe company instructs, just do it. 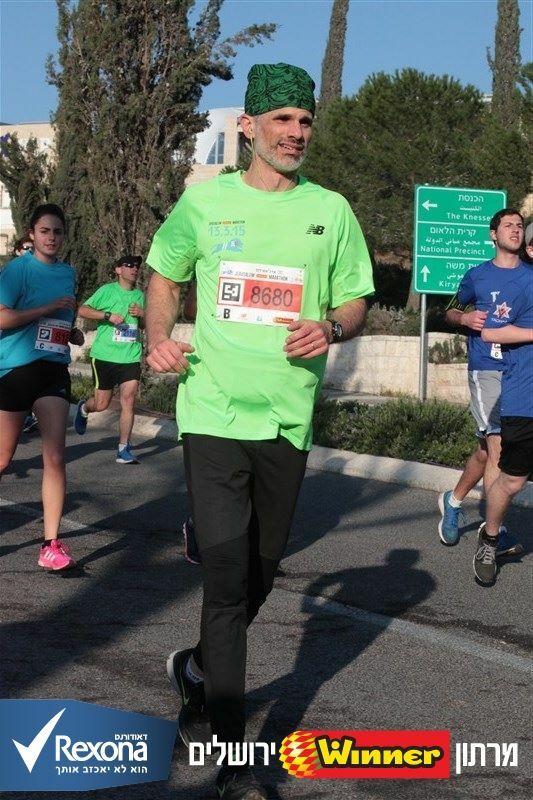 I found myself deeply moved by the masses of Am Yisrael–and our dear friends and supporters, many of whom came at no small expense, to participate–running in this year’s event. I was moved to tears several times seeing how many participants were running in memory of victims of war and terror, as well as those participating to raise awareness and funds for those whose lives have been impacted by war, illness, poverty, and various misfortune. I was also quite overjoyed seeing my lovely and wonderful wife, Ilana Sobel, *** four different times (!!) *** during the course of the race!! Thank you, sweetheart, for tracking my route and turning out to cheer me on … and for the great photo of me chugging away at km 11. As you may recall from my post following last year’s race, I really connect with my Dad’s memory during the Jerusalem run, especially when things happen that can’t be explained in any rational framework. Last night, a very dear overseas friend with whom I hadn’t been in touch in some months, contacted me asking what impressed me as a deeply mystical question, one that’s quite out of my league … but right up Dad’s ally. That I was able to provide an answer by scanning him a page of Dad’s Kabbalah Notebook left me with an immensely connected feeling, which augmented quite powerfully during the last 4 km today, when my physical energy is rather drained, and I’m running more on resources of the Spirit. Thank you all, dear ones near and far, for reading my post. And biggest thank you to the Ultimate Timeless Experience and Eternal Companion for bringing about the Conditions of Life on Earth for this moment to happen. ברוך אתה יהוה, אלוהינו מלך העולם, שהחיינו וקיימנו והגיענו לזמן הזה. My newly discovered “secret” to success: running—or any sport based around individual endurance—isn’t about you against yourself; it’s you with yourself. Because open-hearted kindness to yourself will get you so much farther than you ego ever will. Be good to each other, everyone. Life’s too short for getting caught up in the BS.